Indonesia was caught by surprise and largely affected by a massive tsunami wave four years ago, which caused approximately 170,000 people to go missing or to be found dead across the sultanate of the Nanggroe Aceh Darussalam province, situated on the northern portion of the Sumatra island. As a result, since then, a large number of small-scale tsunami warning systems have been installed across the archipelago which contains about 17,000 islands, all within the seismically-active zone dubbed “The Pacific Ring of Fire”. These systems are designed to alert the population as soon as possible before a new disaster strikes. But specialists indicated that the efforts are far from providing efficient results, especially since a vast portion of the country still lies outside the zone covered by the systems. In order to address this matter, a novel system built in cooperation with foreign institutions, such as the German Research Center for Geosciences, is currently undergoing installment operations. It relies on sensors located both on the seabed and on the shore, which will transmit information regarding the seismic activity to surface buoys. 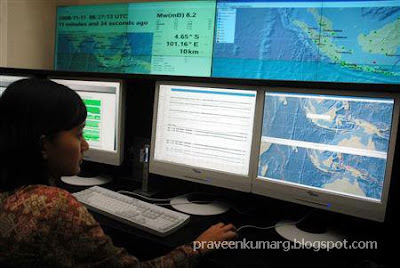 In turn, these will further send the data towards an Indonesian tsunami early warning center. The first two of the total of ten buoys are already in place, with four more to be installed soon, and the whole system, which will ensure accurate data five minutes after the occurrence of a quake, is estimated to be functional within two years. Still, specialists believe this is impossible to achieve without first installing a minimum of 22 buoys, 160 seismographs and 120 digital recording tide gauges. According to Thomas Rachel, the parliamentary state secretary of Germany, quoted by Reuters, “We are starting the world’s most advanced tsunami early warning system able to issue the quickest possible warnings with a high degree of reliability“. Indonesia’s President, Susilo Bambang Yudhoyono, backed up the statement, “This tsunami early warning system signifies our progress and readiness in efforts to prevent or at least reduce the effects of earthquakes and tsunamis which can happen anytime and anywhere”.